Anna Black began practising mindfulness as a way of managing her own general and work-related stress, and was one of the first teachers to offer secular mindfulness classes in central London. Her professional background in publishing means she knows first hand the pressures of the corporate world and the importance of managing that stress. Anna feels very strongly about making mindfulness accessible to people before they reach crisis point, which is why she is delighted to make the 8-week Stress Reduction Through Mindfulness course available to the general public outside the NHS. Anna has been teaching since 2006 and has had extensive training in the teaching of mindfulness. She has a Masters in Mindfulness-based Approaches to Health (Bangor) and has completed various teacher trainings including the Advanced Teacher Development Intensive run by teachers from the Centre for Mindfulness Research and Practice and the Center for Mindfulness at UMass, USA. She gives professional supervision to other mindfulness teachers. As well as teaching to the general public Anna has taught mindfulness in local government, the NHS, organisations, schools and into the creative industries in various formats including 'well-being days', 'taster sessions' and short courses as well as the traditional 8-week course. Anna has a Masters with Merit in Mindfulness-based Approaches to Health from the University of North Wales, Bangor. She is a registered practitioner on the UK Network for Mindfulness-based Teacher Training Organisations UK Network for Mindfulness-based Teacher Training Organisations and also on the Mental Health Foundation’s Be Mindful website In addition to completing the Masters programme over five years, Anna has completed extensive supplmentary teacher training with teachers from the Centre for Mindfulness Research & Practice, Bangor, and the Center for Mindfulness in the USA. She has an established personal practice and regularly attends retreats to deepen her practice. She follows the UK Network of Mindfulness Teachers' Good Practice Guidelines. Good Practice Guidelines for teaching mindfulness-based courses. Anna's first book Living in the Moment: Don't Dwell on the Past or Worry about the Future, Simple Be in the Present with Mindfulness Meditations (Cico Books, 2012), was one of the first non-academic books on mindfulness, deliberately targeted at the general reader. This illustrated book is an accessible introduction for anyone new to mindfulness and it includes ideas and meditations for introducing mindfulness into your everyday life. It has already sold over 25,000 copies around the world. "Anna Black suggests short and simple meditations that you can do throughout the day to strengthen focus and concentration and help you deal with stressful situations. I totally recommend this book, I learnt a lot at a time when I didn’t really have the patience for anything. Anna Black is a life saver." Living in the Moment was followed by Mindfulness @ Work also published by Cico Books and published in September 2014. Cico Books published a gift edition of Living in the Moment called The Little Pocket Book of Mindfulness. The material has been re-designed and new illustrations but the essential content remains the same. Anna has a love for the arts and writing: she is a published author, and the only UK certified and licensed teacher of Betty Edwards's world-renowned ‘Drawing on the Right Side of the Brain’. Anna taught the '8-week course' regularly with Catherine Grey. In addition, recognising the the importance of continued support after the 8-week course is over, Catherine and Anna started the follow-up courses and day retreats for their graduates. Anna continues with these with these as Catherine has emigrated in October 2009. How do you choose the right mindfulness teacher for you? If you are not sure how to find the right mindfulness teacher for you, you might find these key points helpful. 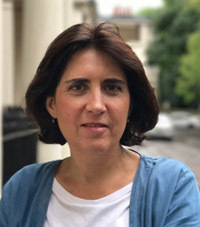 Catherine Grey began teaching mindfulness classes to the general public in London 2006, and is involved with workshops and presentations in a variety of educational, health, third sector and business settings. In October 2009 she emigrated to Australia where she will continue to offer mindfulness teaching. Catherine has been awarded her MSc in Mindfulness-based Approaches through the Centre for Mindfulness Research and Practice, University of Wales, Bangor.